Your attack plan on GE. Boeing (BA - Get Report) is the top performer among the eight "Dogs of the Dow" for 2017. The stock began the year with a dividend yield of 3.65%, but with the stock up 22.7% year to date, the dividend yield has slipped to 3.18%. General Electric (GE - Get Report) is one of the weakest components among the 30 stocks in the Dow Jones Industrial Average. GE is down 10% year to date, which has improved its dividend yield to 3.44%. Technically, Boeing is considered a momentum stock as it began the month setting an all-time intraday high of $191.70 on June 2. The stock is in bull market territory, 35.2% above its post-election low of $141.29, set on Nov. 8. General Electric set its post-election high of $32.38 on Dec. 20 and is in correction territory, 12.1% below this intraday high. The stock set its post-election low of $27.10 on May 18 and is 5% above this level. The weekly charts below shows the 200-week simple moving average, which is considered the "reversion to the mean." The weekly charts also show the five-week modified moving average and momentum study along the bottom called the 12x3x3 weekly slow stochastic reading, which scales from 00.00 to 100.00. A reading above 80.00 is overbought and a reading below 20.00 is oversold. Boeing shares were up 1.2% to $193.30 on Wednesday in early afternoon trading, and GE was up 0.4% to $28.56. Jim Cramer and the Actions Alerts Plus team dig into energy often. Get their insights or analysis with a free trial subscription to Action Alerts Plus. 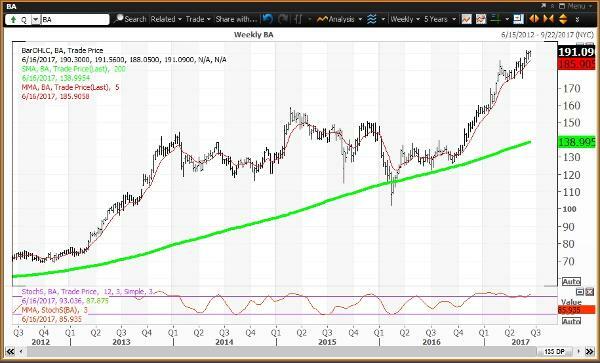 The weekly chart for Boeing is positive but overbought, with the stock above its five-week modified moving average (in red), at $185.91. The 200-week simple moving average or "reversion to the mean" (in green) is $139.00. The 12x3x3 weekly slow stochastic reading is projected to rise to 85.94 this week, above the overbought threshold of 80.00. Current strategy: Buy weakness to my annual value level of $177.45. Reduce holdings on strength to this week's risky level of $195.74. 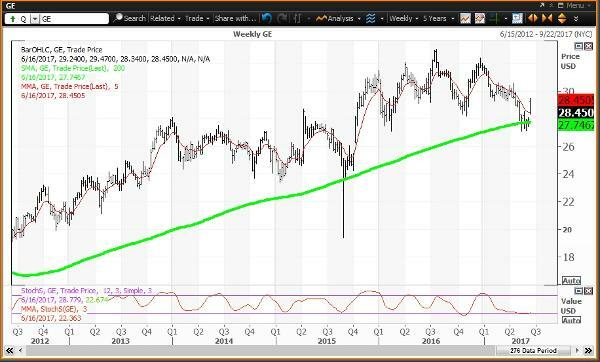 The weekly chart for GE will end this week positive if the stock is above its five-week modified moving average (in red) at $28.45. The 200-week simple moving average or "reversion to the mean" (in green) is $27.75. This level has been a stabilizing force since the week of May 18. The 12x3x3 weekly slow stochastic reading is projected to rise to 22.43 this week, moving above the oversold threshold of 20.00. Current Strategy: Buy weakness to this week's value level of $27.17. Reduce holdings on strength to my annual risky level of $32.68.